When I began gardening, I had never heard of hardy geraniums; I learned about them from a book on perennial gardening and was captivated by the photos. I now have hardy geraniums growing in almost every part of the garden, and my collection includes at least a dozen different varieties. I love these plants not only for their beautiful flowers, but also because their foliage remains attractive when they are not in bloom. 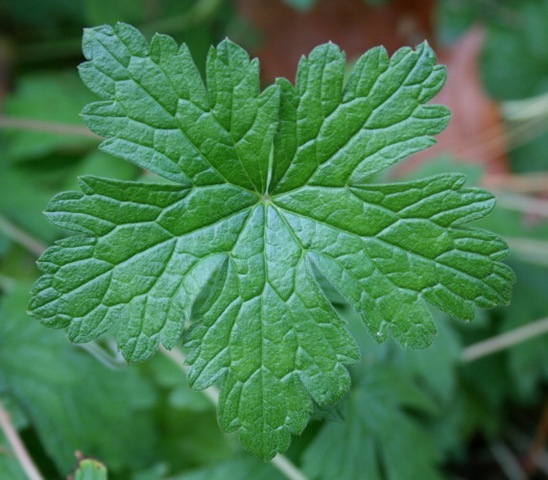 Geraniums grow well in my sandy soil, they are among the easiest of plants to divide, they are pretty much free of diseases and pests, and even the varieties rated for zone 5 have survived in my garden on the zone 4/5 border. 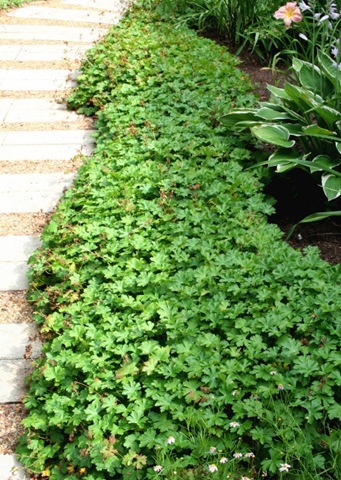 One geranium that grows in many places in my garden is G. x cantabrigiense ‘Biokovo.’ This is a low-growing groundcover that makes a great edging plant for the front of the border. Biokovo graces my garden in June with masses of white flowers tinged with pink; and when it is finished blooming, its foliage provides a neat band that remains attractive throughout the season. The leaves and roots emit an astringent but pleasant aroma when they are touched. I became acquainted with Biokovo at the wonderfully eccentric nursery that Jean Moss used to run at her home in mid-coast Maine. Six years ago, at the end of the season, Jean sold me two divisions of this plant for $5 each and explained that I could pull the roots apart with my fingers to divide them into smaller clumps. I divided my two pots into eight small handfuls of roots and spaced them out along the front of the deck border. The following spring, each of those small divisions came up as a clump about 9” in diameter, and by year after that they had doubled in size and grown into the solid band that you see here. Because these plants expand in all direction by sending out shallow roots, I do need to thin them out each year. (I don’t consider them invasive, though, because they are so easy to pull up where they are not wanted.) I can’t bear to throw these lovely plants away, so I’m always looking for new homes for the ones I’ve thinned out. At this point, I have a 35’ edging of Biokovo along the front of the deck border, I have planted a 25’ row of it along the front of my property, and I have used it as edging in both the circular bed and the fence border. In addition, I’ve established divisions in my Gettysburg garden and I’ve given them away to countless relatives, friends, casual acquaintances, and co-workers in Maine, Massachusetts, Rhode Island, Pennsylvania and Maryland. And all this from the two $5 pots I bought six years ago! If my retirement portfolio yielded even half this return on investment, I’d be retired by now. Many of the G. endressii varieties and hybrids are pink. I have both G. endressii ‘Wargrave Pink’ and G. x oxonianum ‘A.T. Johnson’ growing in my deck border. These two plants, originally planted side by side, have grown together so that I now have trouble distinguishing them, except that one has flowers that are slightly more salmon and the other has flowers that are more silvery. 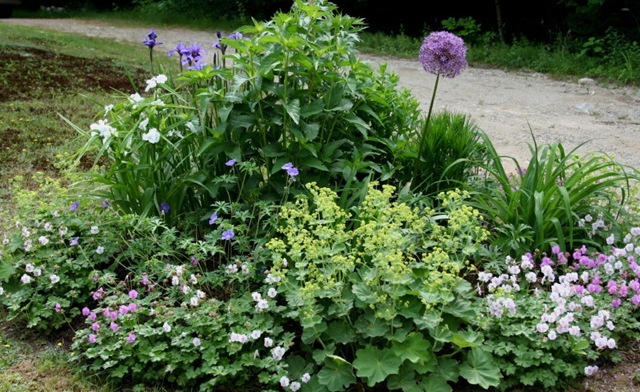 I love them both and have included a division of this combination in the new fence border. Even with all these hardy geraniums in my garden, there are so many more I would like to grow. I know that I will keep dividing old varieties and adding new ones as I develop new areas of the garden in the years to come. 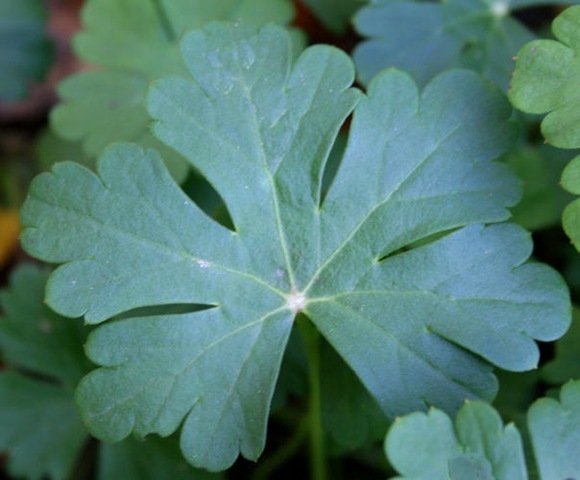 I agree Jean – the geranium is a wonderful plant and I have them all over my garden because they give me such joy! They flower and flower; fill in the gaps; and look spectacular. And best of all, you can divide them and fill in other sad-looking spaces. Jean, I wish I lived closer to you. I really need some ground covers to fill in and cover the endless miles of wood chips. Biokovo sounds perfect, I shall look for some in the spring. I LOVE geraniums (and lady’s mantle)! Yours are beautiful! And I will pick up that Biokovo if I ever come across it. I also love their fall color. Enjoyed this post very much. Hi Jean~~ I heartily recommend G. ‘Patricia’ and ‘Jolly Bee.’ They are fabulous, season-long bloomers. ‘Patricia’ gets quite large and does best cavorting with more upright neighbors. I have to divide ‘Jolly Bee’ every year otherwise it quickly outgrows its space. I have ‘Karmina’ too and love the foliage as much as the flowers. I love how you’ve used it as an edging plant. I splurged this year and bought three new varieties. G. phaem ‘Samobar,’ G. cinereum ‘Purple Pillow,’ and G. sanguineum ‘Elke.’ Purple Pillow is blooming again! I’ve found that the genus Geranium can quickly become an obsession. Now I’m off to tour your garden. Grace, thanks for the recommendations. I just recently learned about ‘Patricia’ (from Allan Becker’s blog) and have plans to include it in my next garden project. I tried ‘Jolly Bee’ and ‘Rozanne’ one year, but neither of them made it. But it might have been one of those years that we had the deadly combination of severe cold and little snow cover, and many of my zone 5 plants didn’t survive what was very much a zone 4 winter. I should try them again. I don’t know why I’ve never tried any G. cinereum or G. phaeum varieties. Fortunately, I plan to completely redo the front of house landscaping in the next few years with many new flower beds and places to try out new plants. Jean, I’ve been reading about this plant and stumbled onto your blog. I makes me chuckle to think there are others out there like me who fall in love with a plant and keep adding it to different spots in the garden. Sweet Woodruff is everywhere in my garden. 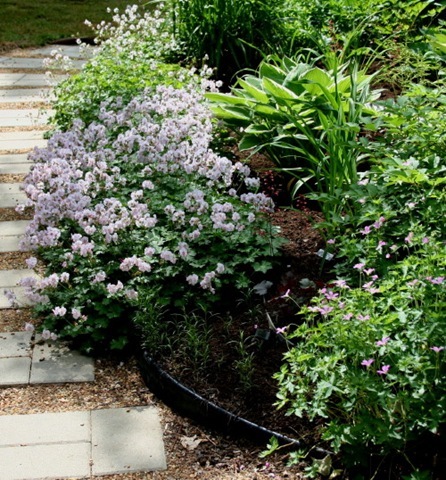 It’s sweet white flowers, fragrance and delicate leaves make wonderful borders. I’m now going to see what variety of geraniums I can find in our nurseries in Michigan. Love your blog. Karen, Thanks for visiting. I find the way plants reproduce themselves one of the most exciting and rewarding parts of gardening, and I can never bear to throw unneeded divisions away. So I either have to find people who would like them or create new garden areas to plant them in!! 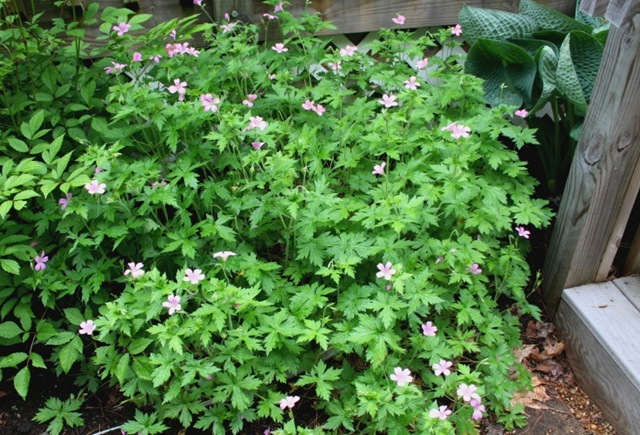 Michigan would seem like a great place to grow hardy geraniums. I don’t know what zone you’re in, but there should be lots of options. I’m just branching out to add a variety I haven’t grown before — Geranium ‘Patricia,’ which I think is a G. psilostemon hybrid and which has been highly recommended to me by a number of gardeners. Although it was named “perennial of the year” 10 years ago, it is no longer available at any of my local nurseries; but I have found it available by mail order at a nursery in Vermont. Happy gardening! 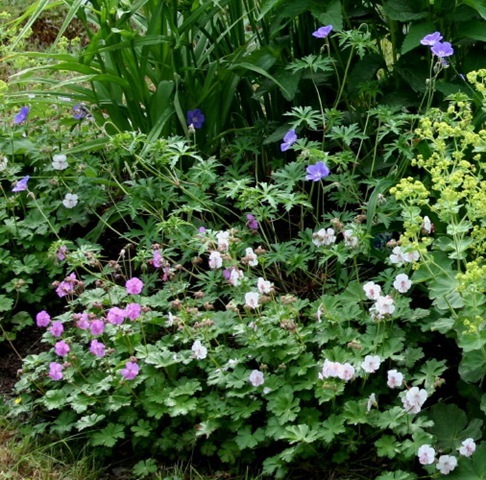 Geraniums are WONDERFUL for filling in gaps in gardens and landscaping– also, your photos are beautiful!